FILE - People wear house models during a march on World Habitat Day in Phnom Penh, Oct. 5, 2015. Former residents of Boeung Kak Lake, Borei Keila neighbourhood and other communities affected by private corporation developers called on the Cambodian government to stop evicting them from their homes. Cambodian activists fighting plans to transform Phnom Penh’s largest lake into a luxury development made a tactical decision when they took to the streets: put women on the frontline to show a “gentle” face and prevent violence. But it was wishful thinking. The women of Boeung Kak Lake, once home to a thriving community, have been kicked, manhandled, threatened and jailed, one of many land battles globally where women are bearing the brunt of the crackdown on protesters. “We are mostly women because we are more gentle so we face less violence. This is our strategy,” said Im Srey Touch, a 42-year-old activist from Boeung Kak Lake. FILE - Cambodian security officers carry off a woman during a protest near the National Assembly in Phnom Penh, Aug. 27, 2014. Boeung Kak Lake residents and other communities who are embroiled in land disputes gathered to appeal for help from the government. 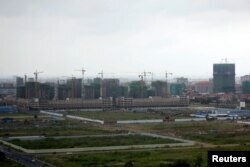 In Phnom Penh the conflict began in 2007 when nearly 4,000 families were stripped of their housing rights after the Cambodian government leased the Boeung Kak Lake area in the nation’s capital to make way for an upmarket mini city. Since then, the lake has been filled with sand and most of the 4,000 families evicted, with little to no compensation, amid complaints about the social and environmental impact. Over the years, more than a dozen activists protesting the evictions have been arrested, most of them women through whom land is passed down in many parts of Cambodia. In February, a court sentenced Tep Vanny, the most high-profile lake activist, to two and a half years in jail for inciting violence and assaulting security guards. Rights observers say the government is using the courts and jails to muzzle activists, including those defending their land rights against government officials and their business cronies. “It is a signal to civil society that ‘We can come after you whenever we want. The courts are ours. We can make anything we say about you stick,’“ said Phil Robertson, deputy director of Asia for New York-based nonprofit Human Rights Watch. The government of Minister Hun Sen’s ruling Cambodian People’s Party (CPP) rejects such criticism and says it respects due process. “The court makes decisions based on the constitution and, like every open society, the court provides justice to everyone no matter who they are,” said government spokesman Phay Siphan. FILE - A construction site from the Boeung Kak Lake project in Phnom Penh, Cambodia, May 26, 2017. Amnesty International has criticized the Cambodian government for “bending the law to their will” to crack down on dissent. It said 42 criminal cases have been brought against the Boeung Kak Lake activists since 2011. “Nobody believes Tep Vanny was assaulting these security guards,” said Robertson, who accused the judges of being “stooges” of the CPP. Home to 15 million people, impoverished Cambodia has a long history of disputes over land rights, many dating back to the 1970s when the communist Khmer Rouge regime destroyed property records, and all housing and land became state property. Cambodia began to privatize land after 1989, when Hun Sen’s CPP-led government shed its communist past and courted foreign investment, paving the way for economic land concessions. “After privatization, land prices started going up, and people were at risk of land grabbing by companies, the state and well-connected individuals,” said Naly Pilorge, director of the nonprofit Cambodian League for the Promotion and Defense of Human Rights (LICADHO). LICADHO says the lack of a publicly available land register detailing boundaries means authorities could confiscate land, claiming that affected families were living on state property. Between 2000 and 2014, about 770,000 Cambodians were affected by land conflicts, according to charges presented by lawyers at the International Criminal Court in the Hague. “Because Cambodia is lawless ... with close ties between companies, government, the military and police, it’s a recipe for violence,” Pilorge said by phone from Phnom Penh. Despite the court cases and jail time, the Boeung Kak Lake women persist. They protest loudly and lie on the ground when ringed and roughed up by authorities. They are arrested in groups, sometimes just two, and, once, 13 of them. Pilorge says authorities now appear to be trying a new tack, turning their energies onto Vanny on whom it is taking its toll. During a brief recess before her guilty verdict Feb. 23, the 37-year-old divorcee who was arrested last August described the impact of her detention on her son, 11, and daughter, 13. “I lost my role as a mother. I have a broken family. My child is sick,” she said, adding that she could not be there for her daughter’s surgery to remove her appendix. “During the last hearing, my daughter cried until she fainted ... I am a mother but I’m in prison. I can’t take care of her,” she said. Activists suspect authorities are using her in a bid to silence other activists ahead of local elections this month and next year’s national vote. A lake activist who was arrested with Vanny last year, Sophea Bov, was convicted for insulting authorities and fined $20. So far Bov has refused to pay the fine, Pilorge said, but no one has come for yet although the judge could imprison her.